Living proof that big sound need not take up more space than a couple of ring binders, Beovox CX50 snuggled in anywhere, even as extras in a Beolink® system. Beovox CX50 and Beovox CX100 loudspeakers were the smallest loudspeakers from Bang & Olufsen up to the time that the manufacture of passive speakers ceased in 2002. 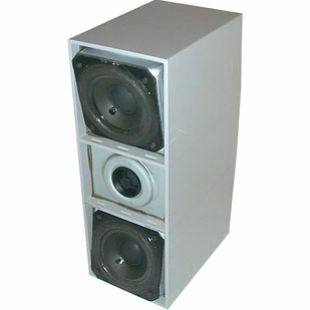 They were mostly used to place within a passive Beolink® system (MCL), although they could also be used as main speakers. Thanks to different colour combinations they blended well into most people's décor. Beovox CX100 finally ceased production in September 2003 - the last of a long and successful line of passive speakers. 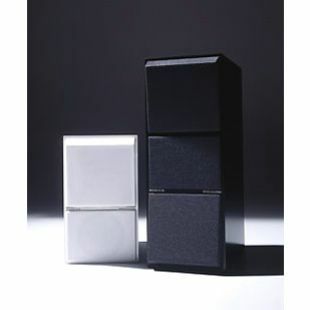 Passive loudspeaker, aluminium cabinet, available in black, white and brushed aluminium. BeoVox CX50/CX100 replaced C40 and was designed to be optionally mounted with the wall brackets supplied in the box. Bang & Olufsen's preferred supplier for brackets and stands, STBbrackets, have made a re-issue of the wall bracket. Distributed throughout the World by the Bang & Olufsen store network, the STB options add to the diversity of mounting options and positions available. WBCX50 has been introduced to meet a growing demand for replacement wall brackets for Bang & Olufsen BeoVox CX 50 and CX 100 speakers. The bracket (sold as a pair) is a faithful reproduction of the original and is offered as a direct replacement. These popular speakers can now be returned to the wall.